Looking for a balance bike for your toddler? Use this guide to help you choose the best one. Balance bikes are among the best ride on toys that you can buy because they help improve a child's balance skills at an early age. Young kids build confidence slowly when learning to ride a regular bicycle with stabilizing training wheels. Some kids never make it to riding a bike at all! That all changes with Balance Bikes. See the video below to get an idea of how they work. Sometimes called 'no-pedal' bikes, these pedal-less machines help a toddler quickly gain confidence and scoot around as if they were professional riders in no time. No more messing around with training wheels! Do you remember your own parents taking off your training wheels only to put them on again because you had not quite mastered riding a 2-wheel bike? What a hassle that used to be. These balance bikes have to be one of the greatest inventions for small children in recent years. Our top pick is the FirstBike so if you are short of time head over to our FirstBike Review. The Strider 12 Pro No-Pedal balance bike wins a 5 star rating because it is very light-weight, easy to build and perfect for toddlers. The all-aluminum Strider 12 Pro is for 18 month to 5 year olds and is the lightest no-pedal bike on the market. A big bonus is that the aluminum frame will not rust if left out in bad weather. 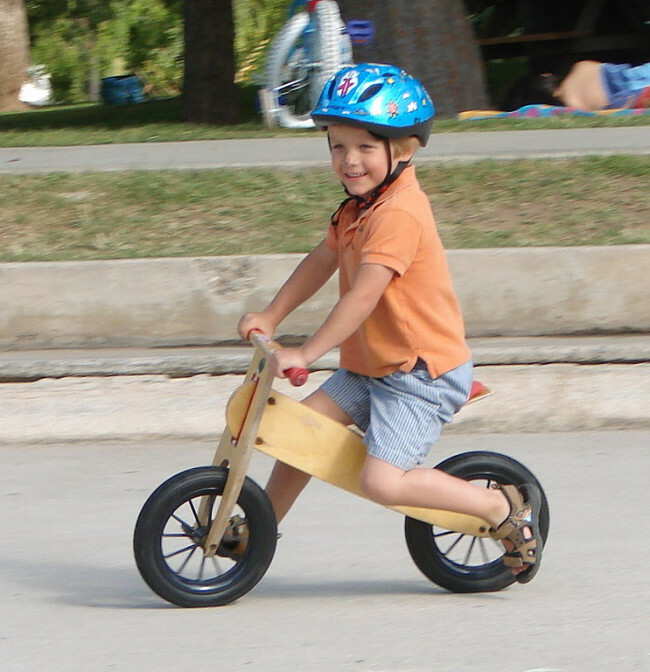 Strider company are committed to their balance bike or 'No-Pedal' bikes, as they call them. Strider have a large online community, lots of Youtube videos and facebook fans. Typical of an American company that like to please it's customers, they are very responsive if you have any issues with their products. The Strider 12 Pro is at the top-end of the market and I would call it a luxury model. It is the best balance bike in it's class. Out of all the metal-framed no-pedal bikes, aluminum is the way to go. It makes for a lighter, more portable and better looking balance bike. The Strider 12 Sport Balance Bike review here is the latest in a long line of sturdy, metal adjustable bikes that have sold over 800,000 around the world. Great fun and essential for kids to develop their balance skills before they move up to a pedal bike. We look in depth at the strong, metal framed 12 Sport Balance Bike in this review. The Strider 12 Sport will grow with your child because the seat can be raised and lowered. Watch them gain confidence on a bike without those nasty trainer wheels. The Strider 12 Sport is available in many colors and will and last a long time so it can be handed down to siblings. You can even upgrade the tires when the kids are older to extend it's life! It's a great mid-priced balance bike that will last. We really hope that our top balance bikes reviews will help you compare and choose the right product for your child. Our reviews do not neccessarily only focus on the cheapest ride-on's but the products which we feel are the best on the market. We also cover other categories such as the best kids electric cars, the best kick scooters for kids and adults and so on, but in this category we focus on here is solely for the foot powered tiny ride-on commonly kown as a balance bike! We know how difficult it is to choose the right one of the many toddlers balance bikes that are available on the market. This is why we cover many brands that offer a range of top balance bikes for toddlers and young chidren, we cover the range from cheap ones to expensive ones. We take care to review both the construction, quality, popularity and fun factor of these best ride-on toys because all these factors are important when choosing a new balance bike for a toddler. In fact our reviews pick out the top balance bikes on the market and evaluate the pros and cons of each model so that takes away the heavy research from you. There are a range of no-pedal bikes on the market.The cheapest tend to also be the heaviest. Sometimes the greater weight may not be a bad thing. A heavier bike will provide more stability and the youngster will feel like they are riding something substantial and more like a real bike. The lighter-weight models use advanced manufacturing techniques and materials to gain the advtantage. Most toddlers are pretty tiny and do not weigh much at all, so a lightweight bike that they can actually pick up could be appropriate. 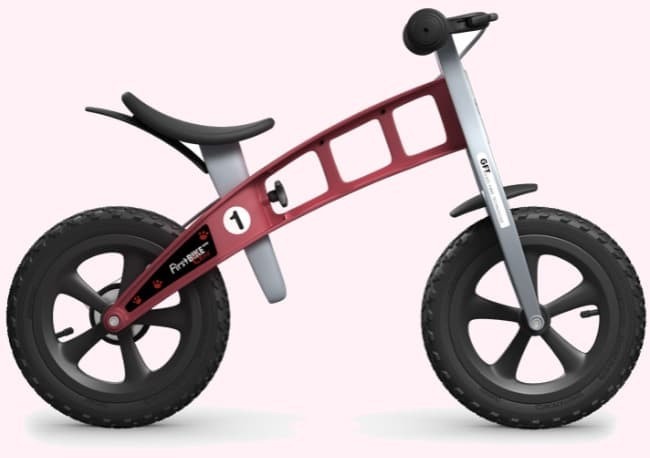 We review all of the top brands including FirstBike (or First Bike), Strider No-Pedal Bikes, Chicco, Jiggy, Tidlo, Stompee, Kettler and Townsend Balance Bikes. If we have not covered one of these brands yet then be sure to check back soon as we are adding new reviews of the best-selling items all the time. One of the slightly confusing issues around Balance Bikes is the terminology. For example, balance Bikes can be called running bikes or strider bikes and this can make it more difficult to find the best ones for your child's needs. It is well known that balance is an important factor in the physical development of a child and helps them gain confidence in other areas. Good balance is the starting point for a child to develop other important skills and a milestone that is essential for intellectual development. The young brain develops balance slowly and small toddlers are still gaining their self confidence in this regard. Anything you can do to help them will put them at a significant advantage. Balance is so fundamental to general development and learning that gaining good balance can help a child learn better. Some children with balance problems or even a balance disorder also tend to find other areas of life a challenge. Kids balance bikes really are the fun way for a toddler to have fun and develop their physical skills at the same time. They are a great pre-cursor to a bicycle or trike with pedals and it is more common these days to see a small child on one of these great little ride-on's. One of the best features of balance bikes is that a child can learn to balance without those old-fashioned training wheels. I didn;t like those training wheels much when I was a kid because it was a bit embarrassing to have to use them! I remember that training wheels were difficult to fix onto a bike and always got in the way of the childs feet. You usually end up taking them off and putting them back on again because the child might not be quite ready to ride without the training wheels! Video of BALANCE BIKE SUCCESS! It is important to consider several factors such as the construction and durability for longevity of the product. Because balance bikes will often be passed along to younger siblings, some of the top no-pedal bikes (as they are sometimes called) can last for several generations if looked after and carefully maintained. You will not just find the cheap or lowest price balance bikes here, because we concentrate on creating reviews of high quality kids ride-on toys that are designed to last a long time. We all know that kids ride on toys can be subject to some heavy handed treatment - so compare the best Balance Bikes here without needing to go elsewhere. We appreciate your feedback on our reviews, so please feel free to contact us and let us know how we are doing or if you would like to see a particular item reviewed. If you need to browse around a bit more and look at the rest of our ride on toys reviews or perhaps electric scooter reviews for older kids then please go ahead! Balance bike are a great way to introduce a young toddler to the concept of cycling, but without the fear of falling off! Great looking site and congrats on the new blog. I’m adding it to my reading list.We really hope that our top balance bikes reviews will help you compare and choose the right product for your child.Really helpful sits for selected balance bikes.Thanks for sharing. Is It Worth Paying Less For The Stompee Balance Bike?